Dr. Robert P. Kirshner, the Clowes Professor of Science at Harvard University, presented the Dean’s Seminar on Friday, February 22, 2013. He graduated from Harvard College in 1970 and received a Ph.D. in Astronomy at Caltech. He was a postdoc at the Kitt Peak National Observatory, and was on the faculty at the University of Michigan for nine years. In 1986, he moved to the Harvard Astronomy Department. He served as Chairman of the Department from 1990-1997 and as the head of the Optical and Infrared Division of the CfA from 1997-2003. Professor Kirshner is an author of over 200 research papers dealing with supernovae and observational cosmology. His work with the High-Z Supernova Team on the acceleration of the Universe was dubbed the “Science Breakthrough of the Year for 1998” by Science Magazine. Kirshner and the High-Z Team shared in the Gruber Prize for Cosmology in 2007. In 2011, two of his former graduate students, Brian Schmidt and Adam Reiss, shared in the Nobel Prize in Physics for this work. A member of the American Academy of Arts and Sciences, he was elected to the National Academy of Sciences in 1998 and the American Philosophical Society in 2004. 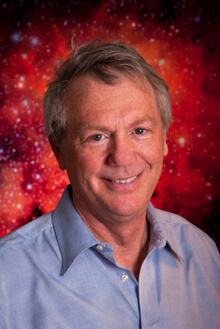 He served as President of the American Astronomical Society from 2003-2005. Kirshner was given the Distinguished Alumni Award by Caltech in 2004. Kirshner is a frequent public lecturer on science. His popular-level book The Extravagant Universe: Exploding Stars, Dark Energy, and the Accelerating Cosmos won the AAP Award for Best Professional/Scholarly Book in Physics and Astronomy and was a Finalist for the 2003 Aventis Prize. For more information on Dr. Robert P. Kirshner, please visit his Web site.